That large "lens" was necessary to capture that object 55 millions light years away (about 5,203 10^14 km). Come to think of it, since the image is actually 55 millions years old, is that "breaking news"? You’re a fabulous reporter at large. I would commend everyone to follow the link. It’s mind boggling. I wonder about the diameter of the black hole. Where does one measure from as it is not an event with a sharp edge. Does one use some second or 3rd derivative in astronomy to measure diameters of suns and other structure with complex margins? But imagine, for one moment, Nicolas, if your home-grown sharpening algorithm did by chance, make a real difference. They would call it the EHBELC, Event-horizon Bordeaux Edge-Lattice Reveal of Claris! How large do black holes have to be to prevent any entering Gods or Demons from escaping? A giant leap for science. Yes what a terrific imge. I have been interested in learning about these since the seventies. The accepted solution for a static black hole (*) is the Schwarzschild radius, which basically defines the point where one cannot escape the attraction of the black hole as the escape velocity becomes faster than the speed of light. It is a direct function of the mass of the object. The particular black hole imaged here is extremely massive and therefore extremely large at 40 billion km, larger than the orbit of Pluto. What we are seeing on the image is not the black hole itself, but structures around it, which are much larger than the hole itself. I would have never been able to imagine that this photo comes 2 weeks before our exhibition NOIRS is presented again to the public (in La Grande Motte this time)! To fly past a black hole, what is the relationship between required minimum velocity to distance from blackhole Schwarzschild Radius? Is it independent of mass of spaceship and mass of blackhole? Fascinating, Nicolas, that you are also exploring the mysteries of emptiness! I am not really sure about what you want to do, but I strongly advise against it. Keep that spaceship of yours near less dangerous objects. It’s not my spaceship, it’s my son’s or, truthfully, Jeff’s. He pays the bills, LOL! In the presentation of the exhibition, we wrote "We keep playing, dreaming, looking even further ... with our desires of drilling holes for light." 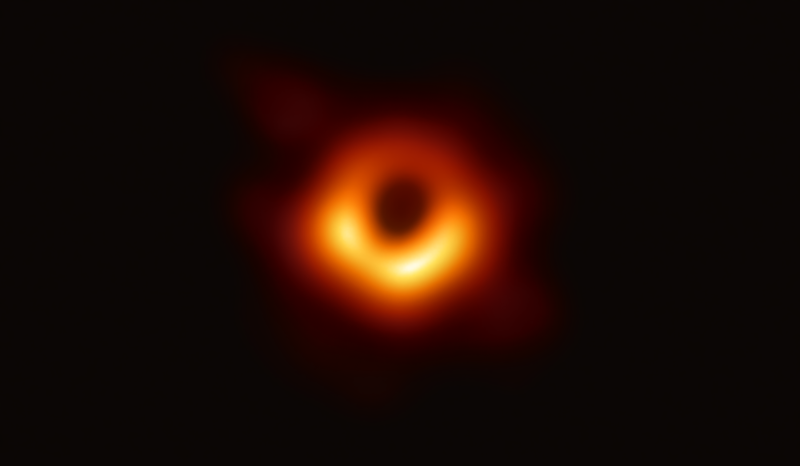 This "photograph" of a black hole is not exactly a classical photography, but we can use it as an extreme example of diffraction limiting. where D is the diameter of the lens aperture (for a photo lens, close to the size of the front glass surface). If we want to image small objects (either because they are very small - microscope, or far away - telescope), we need a correspondingly large aperture. To get an image of that black hole, which is quite afar, we need a quite large aperture. We need an even bigger aperture in the case of the M87 image, because the wavelength used (represented by λ in the Rayleigh formula) is 1.3mm, 2000 times larger than visible light. With visible light, a 6 km telescope would be sufficient, but we cannot do that in the visible. To emulate these very large apertures, a set of telescopes near the edges of the virtual aperture are used and the data is combined. This is done in optical wavelengths by interferometry, for example by the Very Large Telescope, but not across 6 km and the number of mirrors involved limits observations to very bright objects. To give an idea of what is possible, one of the largest interferometers is the Infrared Spatial Interferometer with a maximum baseline of 70m. At radio frequencies, however, combining radio telescope data taken across continents becomes possible. Thanks again Jerome for being our guide. This physics and close cooperation between thousands of scientists is simply phenomenal and humbling to anyone that is even slightly boastful about their own achievements! Imagine that this was predicted based on theory 100 years ago and now it’s confirmed to be consistent with the mathematical predictions that were developed. Parameters of the conjoint virtual worldwide “aperture” is probably one of the greatest organizational achievements of mankind!